New York (N.Y.) - Mentioning that Du Bois was wonderful at the Madison Square garden meeting, and mentioning that he has been a member of the American Labor Party since 1936 when it was founded. 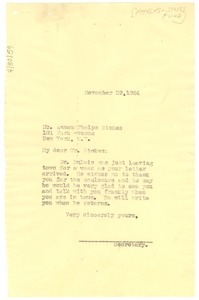 New York (N.Y.) - Du Bois informs Brown that he currently does not know of any available work. 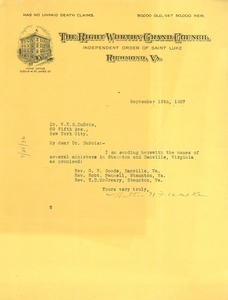 Richmond (Va.) - Concerning the names of ministers in Staunton and Danville, Virginia. 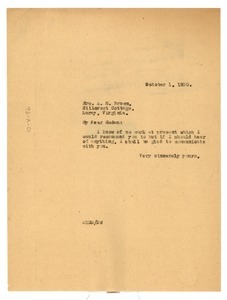 Written on letterhead of The Right Worthy Grand Council. 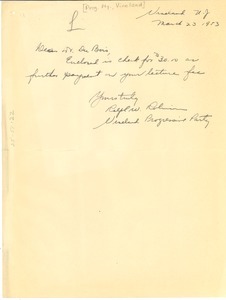 Vineland (N.J.) - Signed Ralph W. Robinson; enclosing $30 payment in remuneration for his lecture in Vineland. Terry (Miss.) 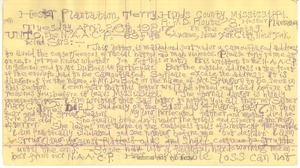 - Concerning the death of Jones' sister due to the "trials and cruelty of the reign of terror" in Mississippi and a help for a girl in Mound Bayou, Mississippi mentioned in the May "Crisis". 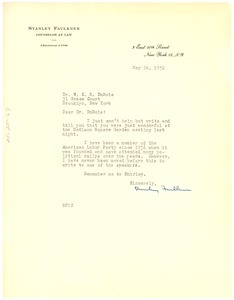 Responding on behalf of Du Bois to thank Stokes for an enclosure. 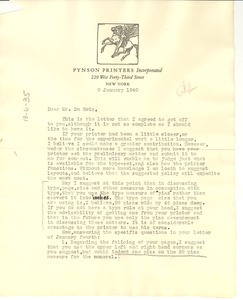 New York (N.Y.) - Regarding the technical and formatting aspects of the impending publication of the periodical "Phylon," effectively answering the two questions of his letter of January 4 (not in collection). 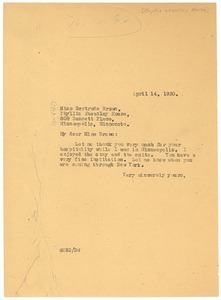 New York (N.Y.) - Addressed "My dear Miss Brown"; thanking her for her hospitality during his Minneapolis stay and complimenting her on her "very fine institution." 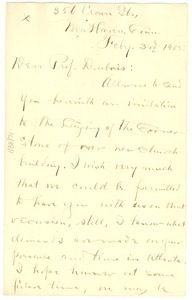 New Haven (Conn.) - Henderson writes to invite Du Bois to the laying of the cornerstone for the new church building of St. Luke's. Boston (Mass.) 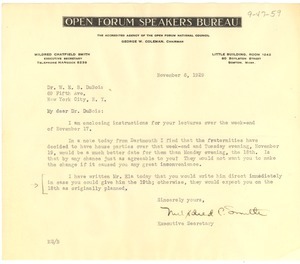 - Concerning logistics for Du Bois' lecture at Dartmouth College.